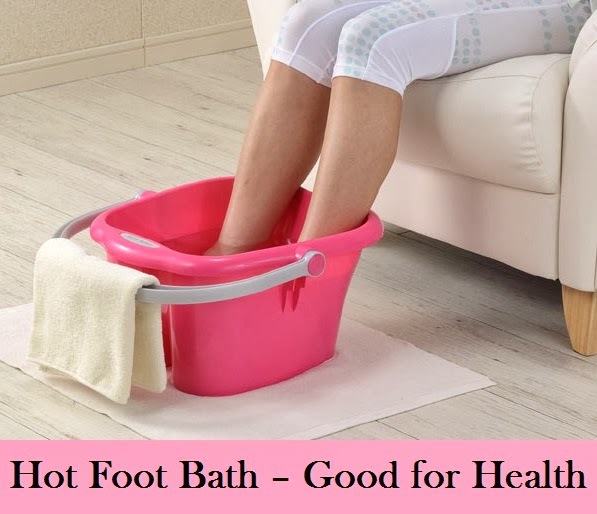 Hot foot bath gives relaxation to the entire body if you are tired and also helpful in eliminating toxins from the body. It is an effective means of reducing congestion of blood or water in the upper parts of the body. When you have to take a foot bath, drink a glass of warm water, sit on a chair and lower you feet in a bucket full of hot water. The level of the water should, ideally, come up to the knees. The temperature of the water should not be too much above the body temperature. As the water gets cold, go on adding more hot water. Take care to see that the hot water added later does not scald the feet. Cover yourself with a blanket. Wrap it around your body; even if the bucket is covered, it will be all right. The head should be covered with a towel wetted with cold water. As the coldness of the towel evaporated, dip it in cold water, wring it lightly and again cover your head with it. In 15 to 20 minutes you will start perspiring. When a fair amount of perspiration has been formed, the bath can be terminated. Wash your feet with cold water afterwards and wipe them with a towel. Wipe your body with a wet towel and dress yourself. An ordinary bath can be taken after the hot foot bath. The blood pressure decreases during the course of the bath. A feeling of giddiness therefore may ensue. This feeling will pass away on resting for a few minutes. But as a precautionary measure, very weak persons, pregnant women and patients with abnormally high or low blood pressure, should avoid taking hot foot baths.